Prince Philip, Duke of Edinburgh, husband of Queen Elizabeth II, grandfather-in-law to America’s very own Duchess Meghan, and 97-year-old operator of both SUVs and horse-drawn carriages, has flipped his Range Rover but is just fine. It’s a sad but common rite of passage for adult children to have to have “the talk” with aging parents when it’s time to stop driving. Which of the royal children will it be? Probably not that sniveling Charles. Maybe one of the grandchildren? Harry seems like he could be kind but convincing. Prince George may be little yet, but he does always have that resting business face, so he could probably do it sternly and efficiently. Prince Philip says he was “dazzled by the sun” at an intersection. The Range Rover rolled onto its side, but bystanders were quickly able pull him out safely. The driver and passengers in the other car were also unharmed. 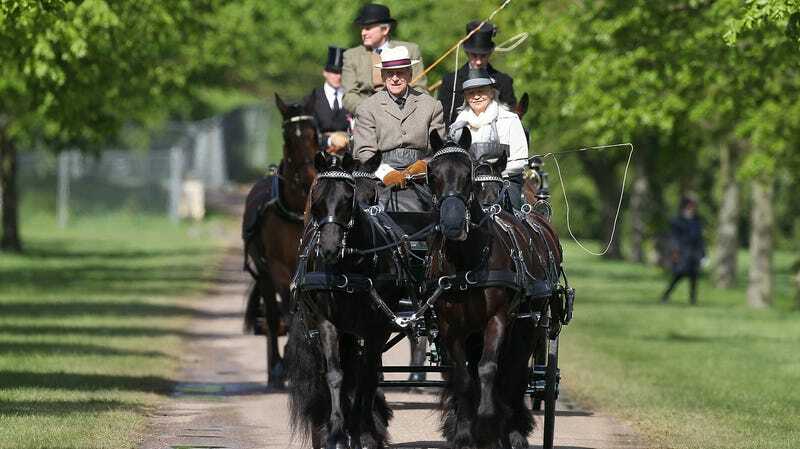 Maybe the royal family can reach some sort of compromise in which Prince Philip can keep driving the carriage but not the car?